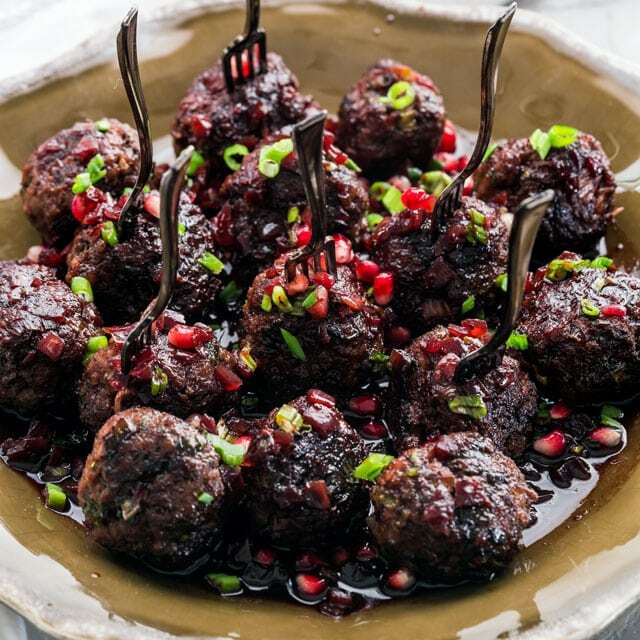 These Pomegranate Cocktail Meatballs are your answer to the perfect party appetizer. 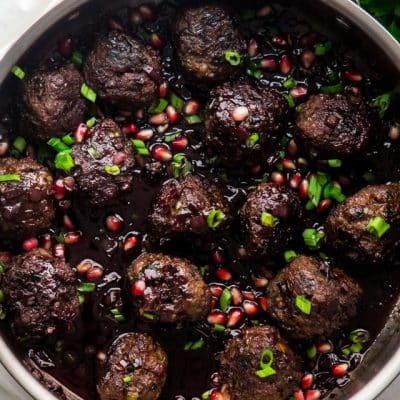 Plump, delicious meatballs are baked then tossed with an incredible pomegranate glaze. The perfect cocktail meatballs. Christmas is over for another year and it seems like every year around this time when I want to share some sort of party appetizer for your New Year’s party, I usually settle on meatballs. What does that say about me? Probably that I love my meatballs and I’m proud of it. I also didn’t share anything with you for the last Meatball Monday Mania, so I’m making up for it now. 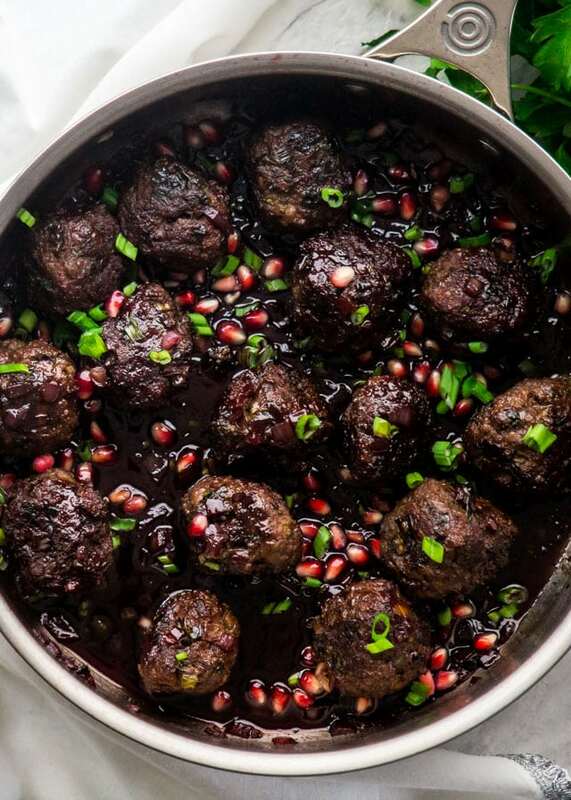 Have you ever had meatballs with a pomegranate glaze before? They are the flavor bomb. Seriously! You take a bite and a burst of flavor explosions happens. You know the saying “party in my mouth”, well that’s what happens. 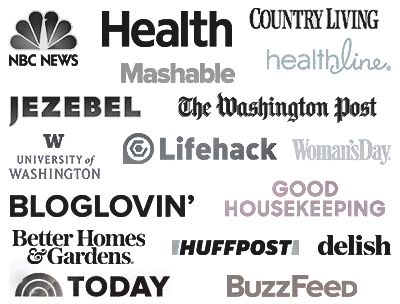 Let’s talk meatballs! I’ve said this before and I’m going to say it again. FORGET the frozen meatballs. Forget they even exist. Who knows what goes into them. Always always make your own, because it really doesn’t take any time at all. Trust me on this. It’s so worth it to put that little extra effort time into making your own meatballs. 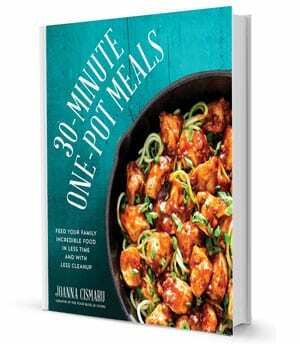 Plus, this is something you can make with your kids and have fun, and teach them how to cook. 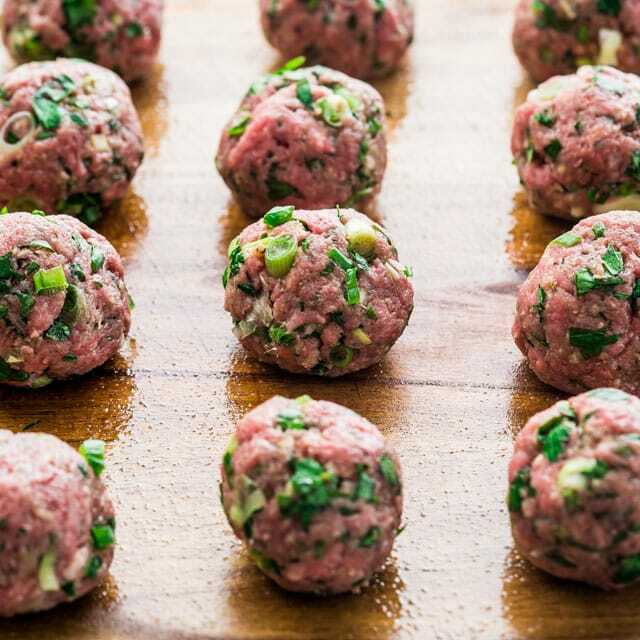 These meatballs are probably more Moroccan inspired if I were to pick a cuisine, but then not really, I’ve added lots of parsley, green onions and some cumin, among the other basic meatball ingredients. Very fresh looking and fresh tasting. I also baked these but check out the recipe notes for frying instructions. I usually bake my meatballs when I’m looking for less hassle, you just pop them in the oven and wait. I made these meatballs a bit larger than I normally do because I wanted a 2 bite meatball. If you’re serving these at a party, and someone takes a meatball, I wanted to make sure they get enough in that little appetizer. Not that they won’t be coming for more, because trust me, they will. 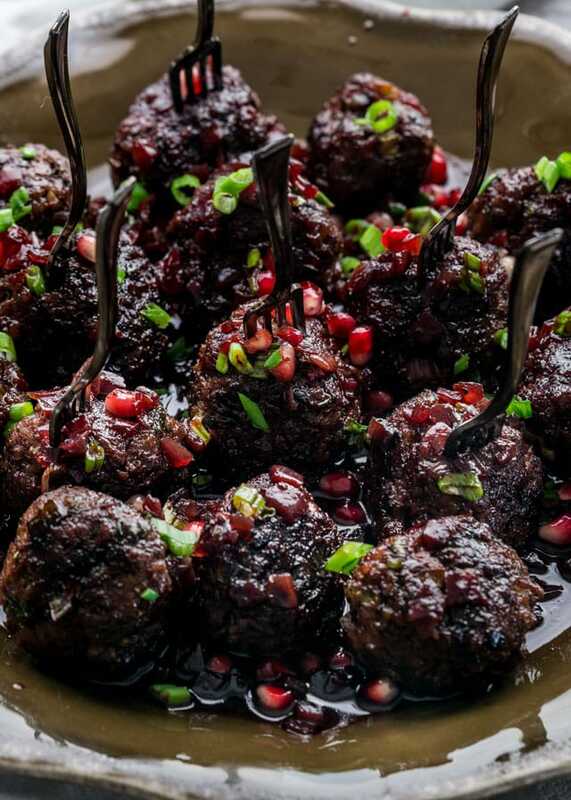 And lastly, let’s not forget that pomegranate glaze because that is the star of these meatballs. It’s sweet, it’s tart, and it’s amazing over these meatballs. Don’t expect this to thicken too much, it will thicken a bit, but mostly you cook it so that it reduces and slightly thickens and develops those deep flavors. So good though. My favorite part about making these is garnishing them with pomegranate seeds and green onions. It just makes them look festive and yummy. Try more of my awesome meatball recipes like these Thai Meatball Lettuce Wraps! In a large bowl combine all the meatball ingredients together. Form the meat mixture into large size meatballs. You should end up with about 15 large meatballs. Please the meatballs on the baking sheet and bake for about 20 to 25 minutes or until done to your liking. Heat the olive oil in a small saucepan over medium heat. Add the onion and cook until softened and translucent, about 3 to 5 minutes. Add the rest of the glaze ingredients to the saucepan, stir and bring to a boil. Reduce the heat to a simmer and continue cooking for about 15 to 20 minutes until it reduces to about 1/2 a cup and it slightly thickens. Place the meatballs into a bowl and pour the glaze over the meatballs, then toss making sure all the meatballs are covered in the glaze. Garnish with pomegranate seeds and green onions. Can I use any other type of meat: Any ground meat would work. Ground lamb would be wonderful with this type of glaze, but feel free to use ground pork or ground chicken. You can also combine meats like ground pork and ground beef together. Is the sauce sweet: The sauce is not too sweet but also a bit tart from the pomegranate juice. If you like a sweeter sauce feel free to adjust the honey quantity. Can I make these ahead: Yes! Meatballs usually reheat really well. If you're making these ahead, store the sauce separately in another container in the fridge. Before ready to serve reheat the sauce either in the microwave or in a small saucepan. To reheat the meatballs just reheat them in the microwave for 2 to 3 minutes. After everything has been reheated, pour the glaze over the meatballs, garnish and serve. Nutrition: If you're making these larger as I did, 2 bite meatballs, you will get around 15 meatballs. Please keep in mind that nutritional information is a rough estimate and can vary greatly based on products used.